They say it’s the little things that count. It’s cliche, but true. A lot of customers I work for are pretty happy with the other companies they’ve hired, the price seems fair, the outcome of the project overall is satisfactory and all in all there are no complaints. Then I get the list, a bunch of things to take care of around the house. Sticking doors, paint the inside of a closet, adjust a door knob or window, maybe the gutter downspout fell or replace a hard to reach light bulb. Sometimes the list includes tuning up some other work that has been done. This last one is always weird. Guys like me refer to this as “batting clean up”. Paying attention where someone else’s attention ran out. We do our best. It’s hard for us because we’re detail nuts. Personally I’m not interested in being a perfectionist. It’s fleeting at best and really, almost impossible. I shoot for perfect and land somewhere near with really good results. But details, I’m kooky for those. 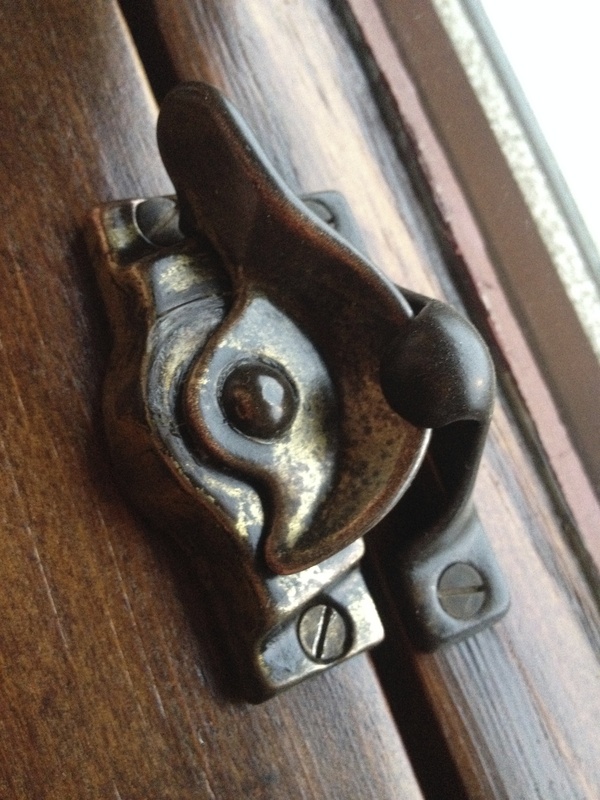 Antique hardware is a favorite for me. 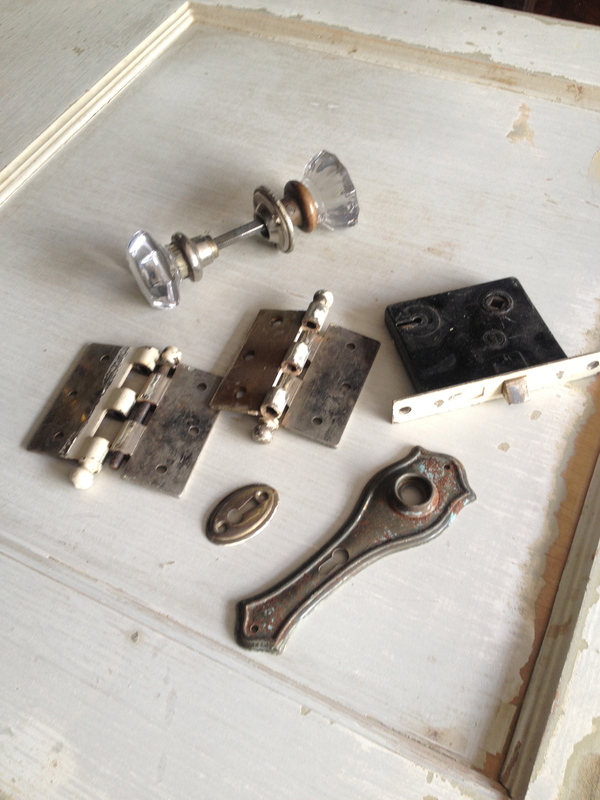 I’m a preservationist at heart, so tearing out old stuff and throwing it away bugs me. 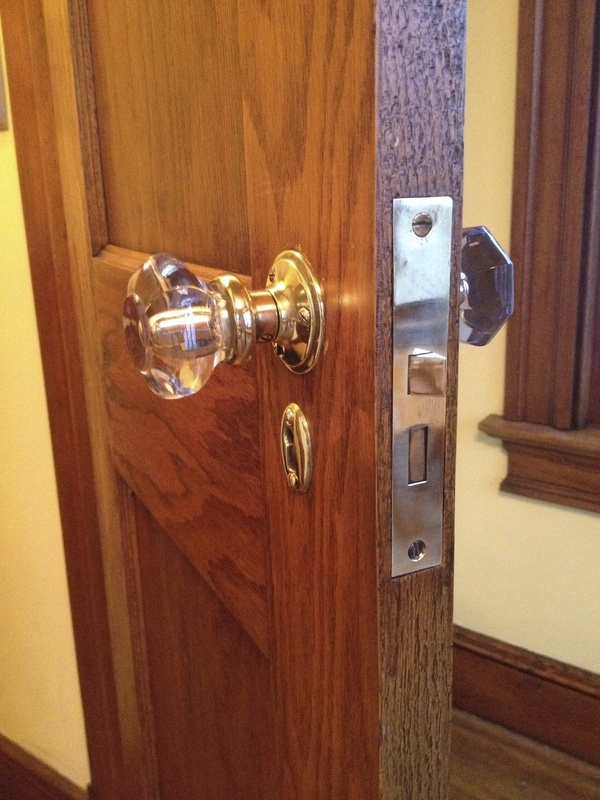 I’ll take a 90 year old door and hardware with 8 coats of paint on it over a new one any day. If it was built into the house when the house was new, I want to keep it there. Antique lock sets seem to last forever. They can usually be repaired and look great. The hinges are rock solid and don’t’ wear out. New 3 1/2″ hinges with ball finials run around $15 or more. The old ones are heavier and fit the door they came off of perfectly. The biggest complaint with old hardware is paint. If the woodwork in the house has been painted, the hardware, especially the hinges have been painted right along with the wood. Some dad with 9 kids and 50 hours of work a week painted these rooms. No time to mask or cut in, just paint the thing. Get to bed and work the next day. Cleaning this hardware is not so bad. 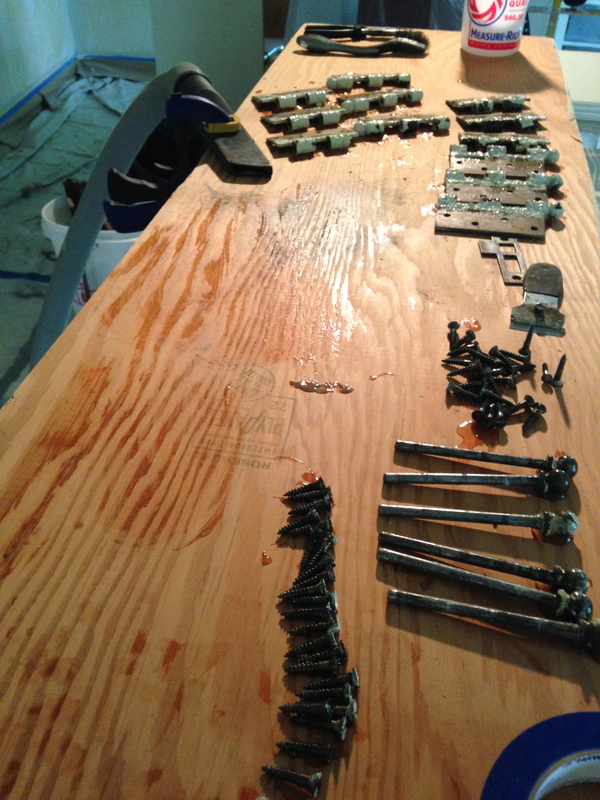 I take everything apart, sorting it into separate containers to keep reassembly easy. I soak the parts in lacquer thinner overnight or I brush on a coat of 15 minute paint stripper (citrus stripper works ok, but it’s slow). 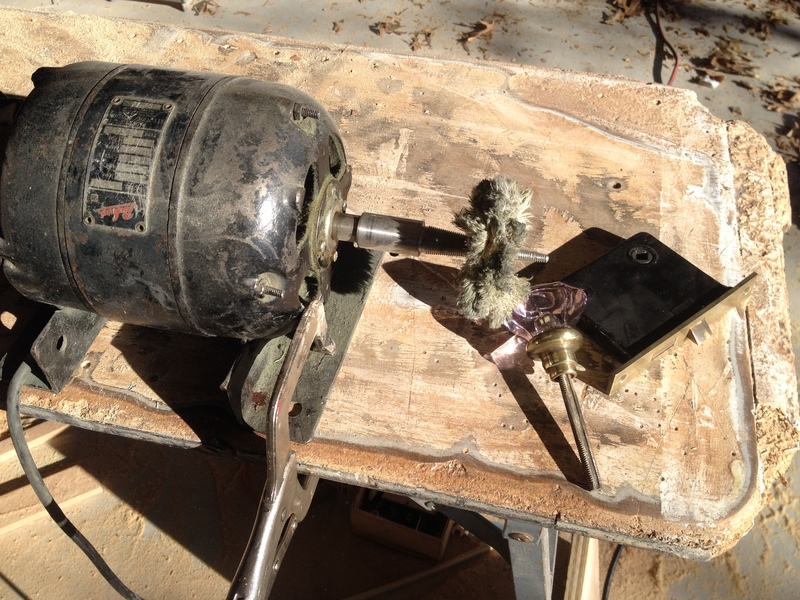 I carefully scrape or brass wire brush the peeling paint off the hardware, keeping a shop vac going to collect the debris while I work. Then comes the fun. Steel hinges get the wire wheel treatment. I use a fine wire wheel on my grinder motor to whisk the remaining paint away, then lay into the steel a little to clean the hinge up nicely. The wire wheel gets into the seams, between the joints and cleans the inside curves of the ball finials. After the hinge is cleaned up I spray a clear coat of lacquer to protect it. I poke all the screws into a cardboard box and spray the heads. Polyurethane works too. 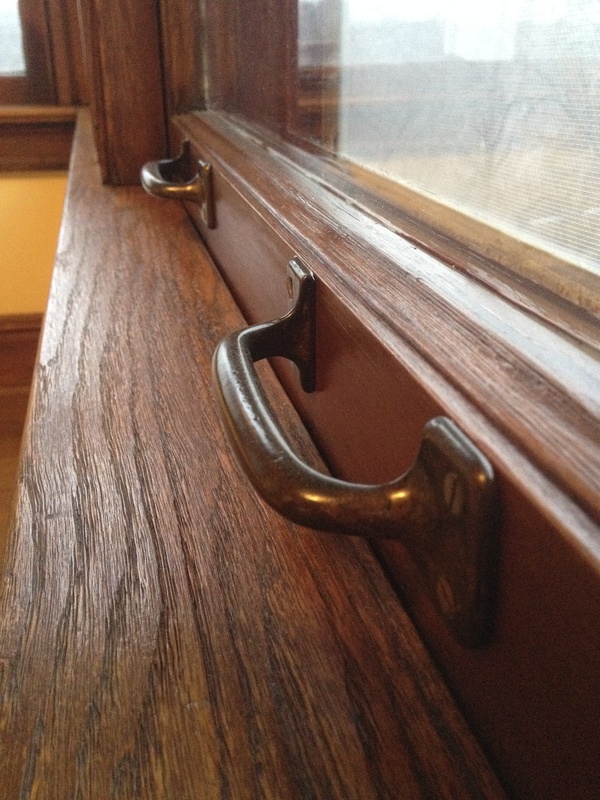 Window handles and some other hardware come in steel too, they get the same treatment. 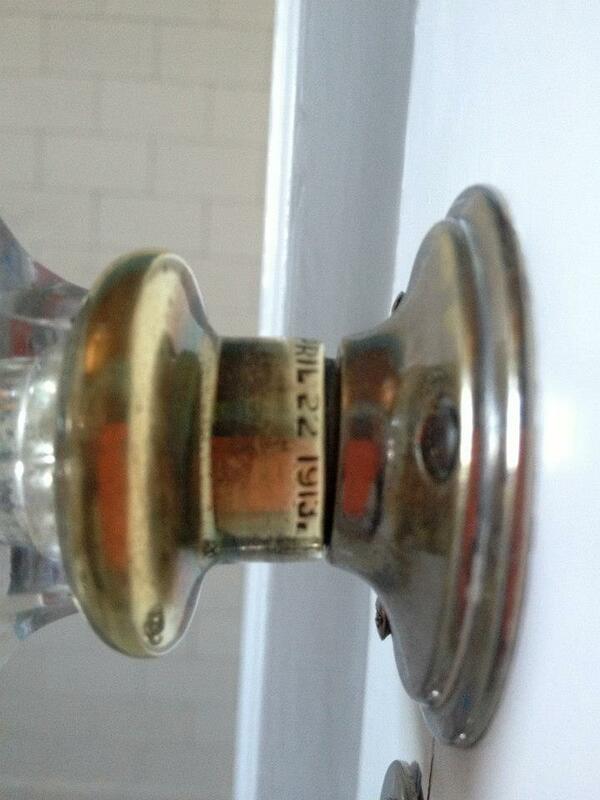 Lock sets are usually brass and sometimes nickel silver. These get the rouge and buffing wheel. I use a motor with a cone adapter. I start with a hard wheel and compound to knock the dark patina off. At this point it will become obvious if the brass is solid or plating. Plated brass will come off revealing a silver color below. I ease into these pieces to preserve the brass coating. Nickel silver and brass can be disfigured if a hard wheel is used too aggressively. I keep the pieces moving. After the patina has been knocked off I switch to a soft fluffy wheel with the same compound and give everything but the screws a final buff. 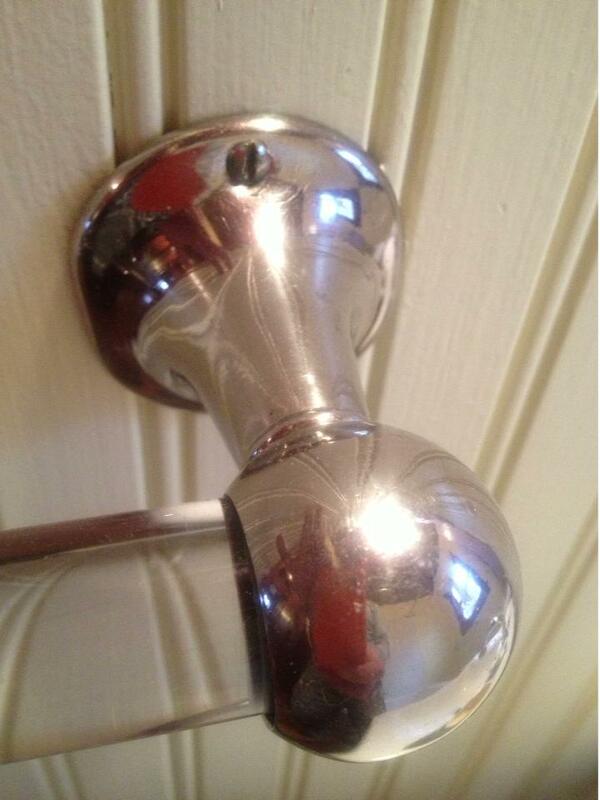 I don’t lacquer brass or nickel, I encourage the homeowner to use a brass cleaner a couple times a year. It looks better. Plus, patina comes on slower than one thinks it might. 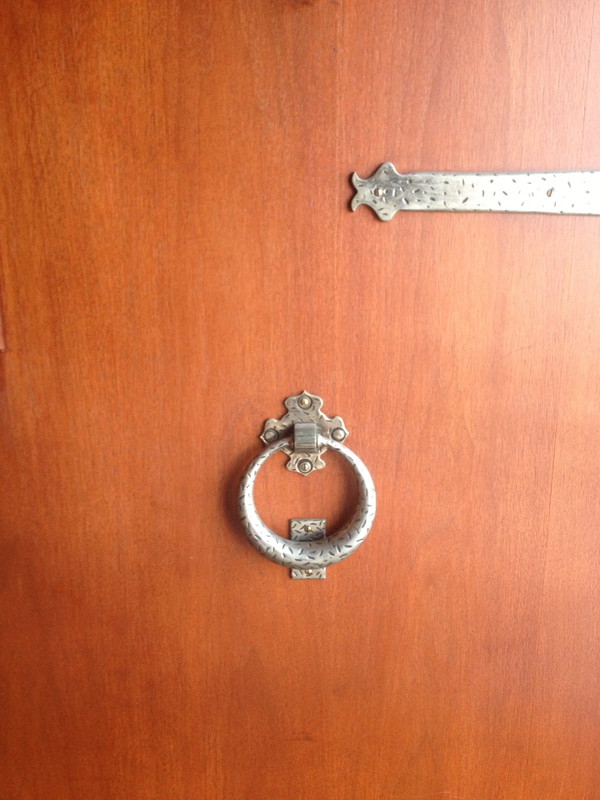 After all the clean up and polishing is done I re-install the hardware onto the door or window. Everything goes back together, original shape and size, same screw holes and most of all original equipment in a beautiful house. Ready for another 90 years of service. This give me great satisfaction. One less door and hardware in the landfill. An old house with it’s character, strength and beauty preserved. And best of all a homeowner who is amazed at the lovely home revealed from under years of paint. Hidden beauty unexpectedly brought back to life and exposed for generations to come. It’s the best. Sometimes I think I’m crazy for this work. It seems old fashioned in a world of speedy installers. I’m guessing this kind of work is done less than not. Actually, now that I think of it, that’s what makes it so special…I’ll stick with crazy.